The definition of intrinsic is “lying within,” and the definition of extrinsic is “outward or external,” and so it is with tooth stains. Some tooth stains can be removed using over-the-counter whiteners while others cannot. The determining factor is usually whether or not the stains are intrinsic or extrinsic, or internal or external. Today your Livonia, MI dentist, Dr. James Stewart, discusses the difference between intrinsic and extrinsic tooth stains. Fluorosis: When children ingest too much fluoride while their teeth are still developing it results in white streaks or specks in the enamel. Severe fluorosis can present as brownish markings. The enamel may also be rough or pitted. The stains resulting from fluorosis are permanent. Tetracycline stains: Tetracycline causes intrinsic tooth stains if mothers take it while their babies are in utero, and if prescribed for children under eight (which doctors no longer do). The actual calcium molecules of the teeth are discolored as they are developing, resulting in teeth with striped stains, or teeth that can look gray, green, or brown. Other medications: Other medications including antihistamines and blood pressure medications can also cause intrinsic stains. 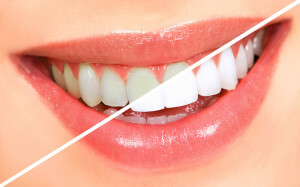 Intrinsic stains are usually corrected with porcelain veneers or cosmetic bonding techniques. Extrinsic tooth stains are stains that remain on the enamel of your teeth. The buildup of plaque and tartar can yellow your tooth enamel, tobacco tar can cause brown or black deposits, and foods and beverages can stain your tooth enamel. Extrinsic tooth stains can be whitened using over-the-counter whiteners and with professional dental whitening. James R. Stewart, Jr, DDS, PC and our compassionate staff proudly serve patients of all ages from Livonia, Farmington Hills, Plymouth, Northville, Dearborn Heights, Garden City, and all surrounding communities. To schedule an appointment, call our office today at (734) 425-4400.